Some people seem to think that going on a guided tour is a defeat. The genuine traveller is (supposedly) the independent traveller. For the most part, I strongly disagree. A good guide sometimes makes all the difference and takes you to places you would never end up on your own. Hot gusts of wind were blowing. The leaves of the date palm flapped with dreary sound; and the glare of the sun hurt the eyes. 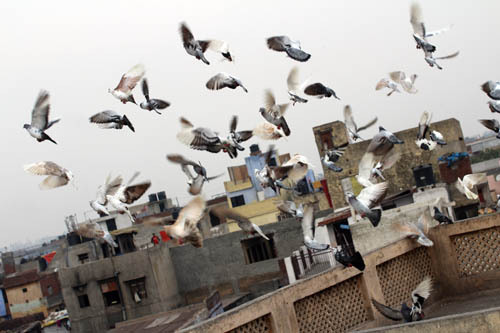 But the pigeon-fliers shouted with gusto, beat corrugated iron sheets, and whistled loudly and long. (Ahmed Ali). I tried to envisage the pigeons, their surroundings and not at least the flying. And suddenly I found myself in the middle of it, on a Delhi rooftop. Dhruv gave his commands; get into position ladies: eek, do teen open the cages. And out came the pigeons. Pigeons on their way out…. The flock swarmed above us. They seemed to disappear in the horizon. Then they came closer, and again almost disappeared. Other flocks appeared, but they all kept to each other. The two men on the rooftop were cooing and calling in many ways; shouting, whistling. They know their flock from any other. The flock knows where they belong. The anticipation grew; how would it look like when they all came back. I was thinking; even if it takes the whole day I want to see the landing because I was now in the middle of Twilight in Delhi. – They will come back, Anju reassured us. We all possibly looked a bit doubtful. Still, we enjoyed the time-out and were kept busy with minor activites and posing for each others cameras. The flock on its way back…. Yes, the flock landed eventually. Nobody counted, but they all came home to their cages. 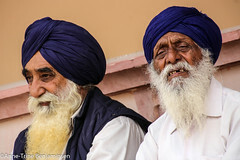 We had got a glimpse of a nearly vansihed life and culture of Old Delhi. I felt exhilerated as we found our way back to the streets of Old Delhi! Thank you Dhruv – thank you Anju. 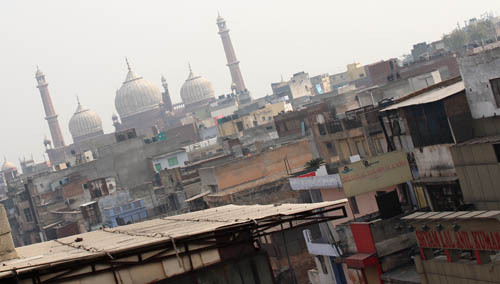 The Jama Masjid as seen from a Delhi rooftop. Thank you for being our guest in our Delhi ! We are privelaged and touched! 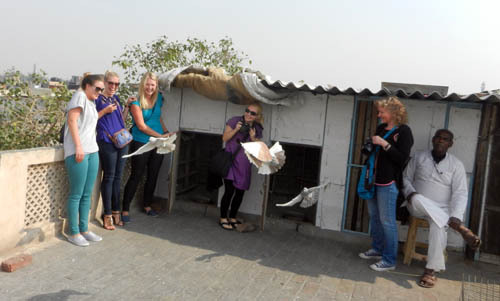 We always recommend our guests that try to see Delhi, not just as a sightseeing tour BUT see it through our eyes to experience the city on the whole with its past and present, with its beliefs and its culture that co-exist. This is off the beaten / eaten tourist path which is refreshing and authentic. We love to personally lead around the neighborhood’s winding streets, sharing the neighborhood’s rich history, delicious food & culture.